Au4f region has well separated spin-orbit components (Δ=3.7eV). Peaks in the Au4f region have an asymmetric peak shape. Binding energy shifts may be observed with Au nanoparticles, however. Casaletto et al. analyzed Au nanoparticles on different metal oxide supports with XPS and found two states of gold, Au0 and Au1+. The Au1+ state was shifted by 2eV from the Au0 state. Gold, Latin aurium for “shining dawn”, has been one of the most valued precious metals since prehistoric times and is mentioned several times in the Old Testament. Gold has been the standard for monetary exchange in many countries. While the metallic element takes on a yellow color en masse, when finely divided it can also appear to be black, ruby, or purple in color. 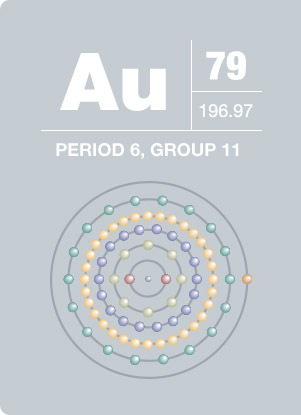 Being that gold is a soft metal, it is strengthened by being alloyed with other metals such as silver and copper. Gold’s heat and electrical conductivity qualities – as well as its resistance to heat, oxygen, moisture, and most corrosive agents – make it most applicable in coinage and jewelry. Seventy-five percent of all gold ever produced has been extracted since 1910. All gold ever refined would form a single cube twenty meters per side.